Punctured by ice & sank. 1864 Owned Confederate States as blockade runner. 1864, Jul 9 Captured by United States. 1864, Oct 5 Commissioned a US Gunboat, at Boston. 1865, Aug Transferred to Army Engineers Survey, renamed ADA. 1868, Jul 1 Caught fire St. Clair Flats; rescued by propeller . 1871, Jul 12 Collision with propeller MESSENGER at Milwaukee. 1878 Owned Peter Smith, Bay City, MI, rebuilt with wood hull, 116 x 18 x 19.5. 1884, Apr 6 Sunk by boiler explosion off Lorain, OH, Lake Erie; renamed PETER SMITH, US1050133. 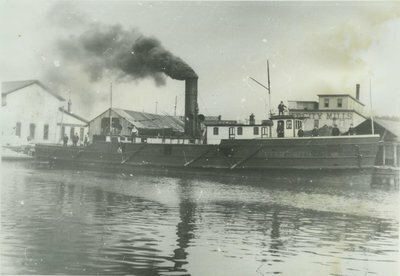 1897 Owned Ben Boutell, rebuilt with iron hull. 1905 Owned Buffalo Dredging Co.
1908 Sold Canadian, owned Robert F. Grant, Three Rivers, QUE; renamed LITTLE ADA, C47635. 1917 Dropped from Canadian list. 1921 Re-registered United States, renamed BUXTON, 161 gross / 109 net tons. 1922, Apr 13 Burned at Berkley, VA.
1923 Owned by Hearn Oil Co, Wilmington, DE, converted to diesel; renamed BETTY JANE HEARN. 1928 Renamed POLING BROS. NO.2. 1935 Owned Chester Poling, New York, NY. 1940, Feb 6 Foundered Long Island Sound.